It is always good to read something a bit different from usual and Doing Life in Paradise was certainly very different from what I would normally read. The author took part in a Q&A on my blog much earlier this year (you can read that here) and at the time I said I would read his book but it has taken me quite a while to get to it. It’s a relatively short book at just over 200 pages but there is such a lot to think about within its pages. Doing Life in Paradise charts the story of several characters living in Paradise. Paradise had been Adelaide in Australia but has been renamed in a rather Orwellian attempt to make the residents feel better about themselves and where they live: “all suburbs in Paradise are to be equal.”. As you might imagine, Paradise is anything but paradise for the characters in the book. They have all been touched in one way or another by a fatal car accident many years before, whether as a witness, relative of the victim or driver of the car. The story unfolds through the eyes of these different characters and the reader gets to know to what extent their lives have been affected by this accident. To some degree they are all ‘doing life in Paradise’ whether literally getting on with life as best they can or metaphorically ‘doing life’ as though in a prison. There is quite a focus on the sexual habits of the characters and there is some strong sexual language. It’s never gratuitous but if easily offended this is perhaps not the book for you. This book was very cleverly written as the reader learns a bit more about each character not only through their own narrative but also through their connections to other characters. And the characters had a lot of connections whether before the accident or in the present time which are gradually revealed throughout the course of the story. The story put me in mind of those Russians Dolls where you open one to find another inside. There were stories within stories and they all seemed to be connected to each other. The final chapters brought the strands of the story together skilfully, revealing even more relationships between the characters. Gary Lines has created a really interesting cast of characters and shows how the effects of trauma can be long lasting but that ultimately, you can go on to have life again, even if not in Paradise. A thought-provoking story, well written and cleverly plotted. Doing Life in Paradise explores the impact and ripple effect of trauma on a group of strangers inextricably linked by, and witness to, a tragic accident. The novel is a surreal voyeuristic journey into the minds and lies of its larger than life characters, each trapped in their own psychological struggle for survival and redemption. Ruby hopes for love, but her destiny is controlled by a malicious spider. Peter laments the loss of love, but prefers to discuss it with Mr Dishwasher. Madeleine discovers rapture while counting down her periods. Hawkey knows if you lie to your psychologist, you are still telling the truth. And Tommy is a killer. Shrouded in survivor guilt, family secrets and lies, finding truth in their stories becomes critical to their survival, and escape from their psychological imprisonment. But how can life in a city called Paradise feel anything but cruelly ironic, how can it not be anything but a life sentence? 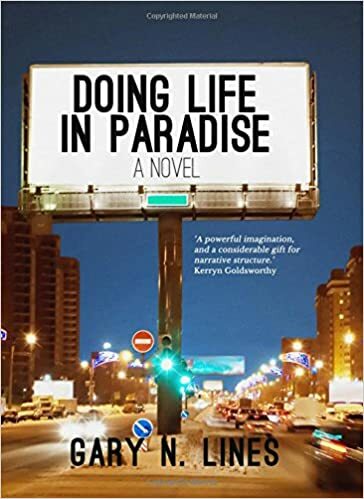 Through the eyes of its flawed characters, and clipped acerbic prose Doing Life in Paradise exposes the absurdity of life and dependence on hope to find meaning within life’s disinterest. The novel explores the peculiar places life can take us, while exposing the curious strategies we each employ in order to survive. This arresting novel will touch anyone who has ever felt lost in life and found comfort in the absurd.